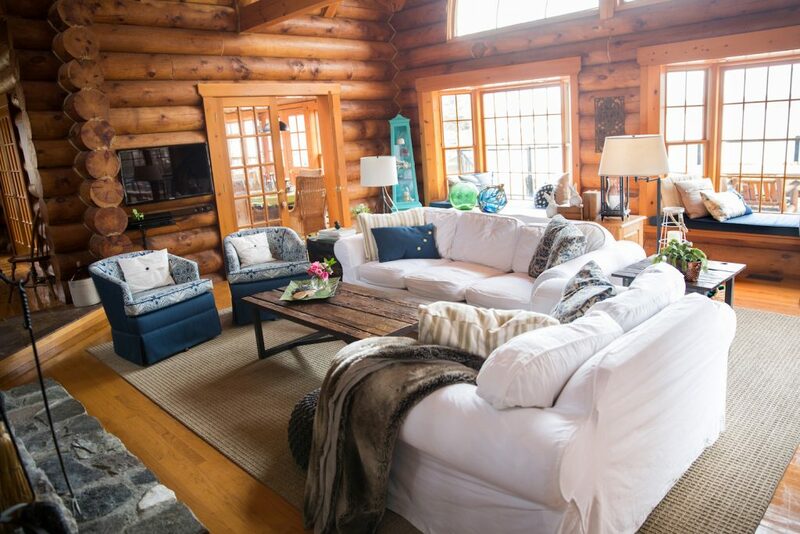 Since lots of you had questions and wanted to see a bit more about our log cottage that was published in Ottawa at Home summer edition, I thought I’d share how I designed and updated the cottage living room on a plan and with a fairly strict budget. Here’s how it looks now. 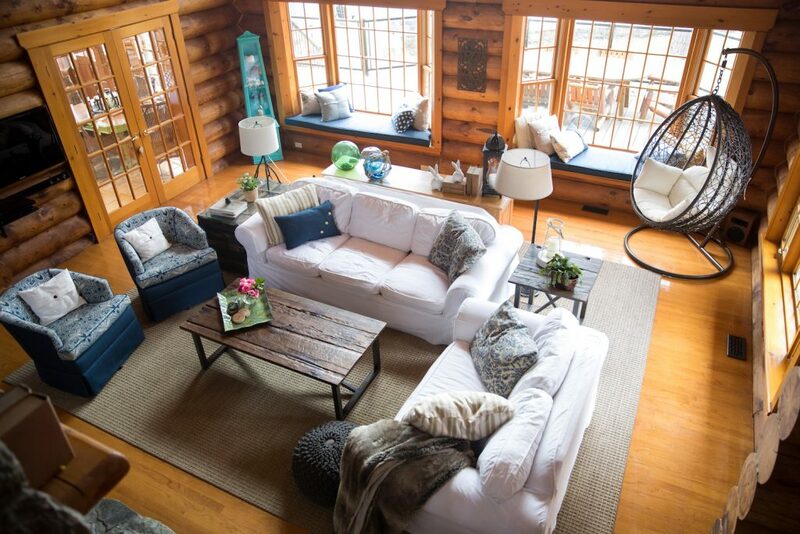 Since it is a large living room, I worked mostly with the furniture left behind and what we brought from our other cottage. By repurposing and reimagining a number of pieces I was able to keep within our budget. 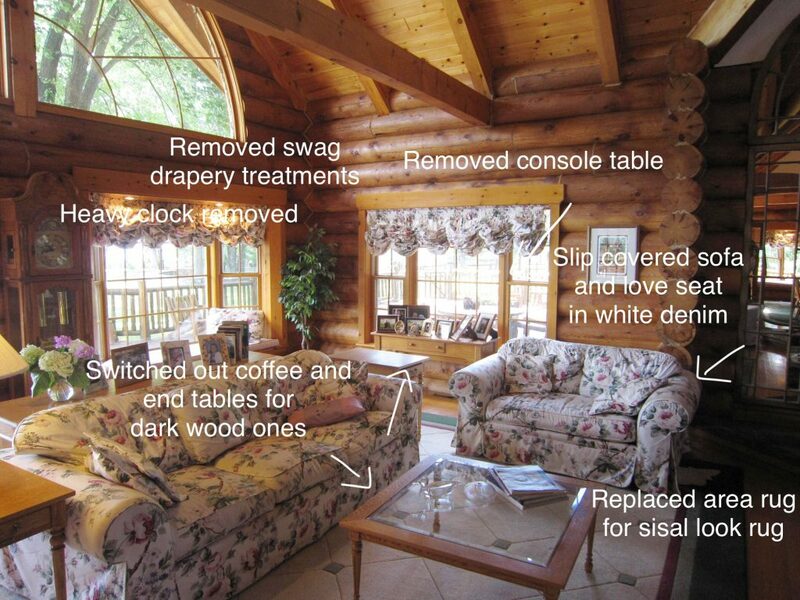 Pictures do say a thousand words so here’s a quick breakdown of what changed in the cottage living room. The sofa and love seat were great quality and in perfect shape, so I quickly decided to slipcover them in a white denim. Slipped off and washed at least once a year they stay clean and fresh. And putting throws where they are likely to get soiled helps keep them clean longer. 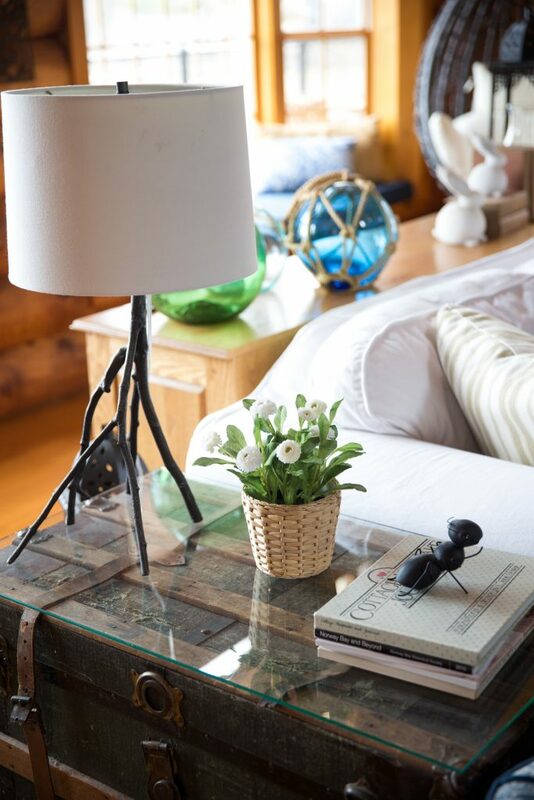 I love that they make the room a little brighter as all wood interiors can get dark. Donating the traditional area rug to a shelter allowed me to have a faux sisal wall to wall rug cut and bound to size. This is the perfect thing to do when you need a specific size or a very large area rug. It has held up nicely and it hides sand very well. Removing the swag drapery treatments lets the view speak for itself. Privacy isn’t an issue and with the large roof overhand that is typical of log buildings, sun damage isn’t either. Simpler and more light, both big pluses in my book. Even if the large clock and console were left by the previous owner, I would have removed both of them, as there was far too much furniture in the space. I relocated the existing occasional tables within the cottage and purchased an end table and coffee table from Urban Barn, with a lucky gift card win. Made from repurposed wood they have the rustic feel and look I was going for. Though they do strike a bit of a challenge when placing your drink on them, with their uneven surface. My grandfather’s travel trunk from the early 1900’s replaced the other end table. I just had a piece of glass cut to fit the top and it has been the perfect thing. 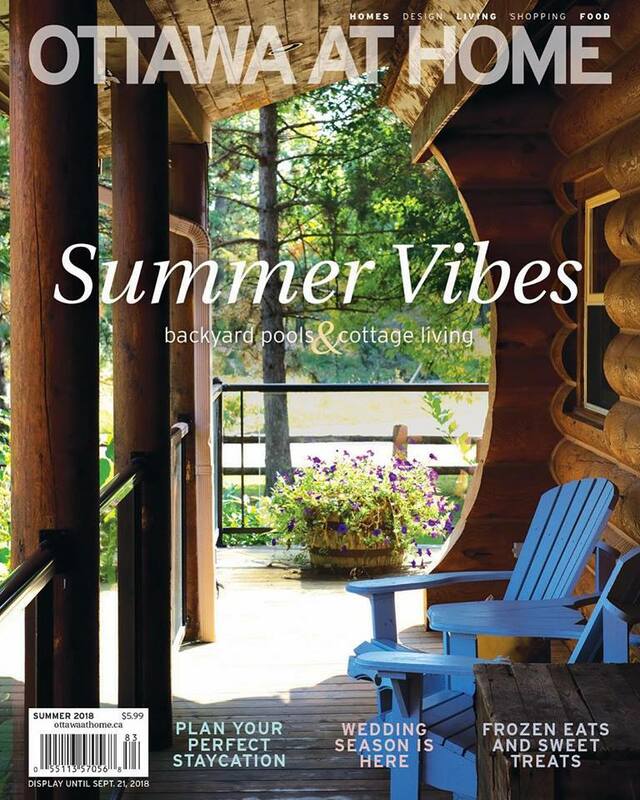 If you want to learn more about cottage decorating click here to read an Ottawa Citizen article that I contributed to. And on the other side of the cottage living room. We upgraded the wood pellet stove for a wood burning insert. Well worth the change both aesthetically and financially, as it has lowered our heating bills substantially in the winter. The two pink swivel chairs were functionally perfect for the space. Even more so after I added the tv behind them, so now you can swivel to watch the fire or tv. With their threadbare pink fabric, they needed a makeover. By raising them up a few inches (they were quite short) and reupholstering them in an exterior fabric they will be used and abused for many years. New foam and a durable exterior fabric completely updated the window seats. The pillows are a combination of ones I have made, knitted or picked up at various shops. Adding my own decor items, like the large clock above the mantel, makes it feel more like us. Since this picture was taken this clock has been switched out for an even larger metal industrial one. Antique books, candles and other decor items are displayed on the mantel itself. You can’t quite see them in these pictures, but I used images from a great desk calendar and put them in inexpensive frames. By stacking them on top of each other, it gives them a bit more presence on the wall. Originally this floor lamp was gold plated and very dated. I painted it black and bought a new drum shade to give it a new lease on life. The cute little turquoise cabinet, a hand me down gift from a neighbour, got a fresh coat of paint. The swing chair lives here in the winter and in the summer it is enjoyed on the back deck. Obviously, budget wise we didn’t do this all at the same time. Being one of our most used spaces, it was high on the priority list. I had a plan and as cash became available I just kept going down my list. That is really the key…to have a plan. You may find things as you go along that aren’t in the plan. That’s okay just as long as you have a good idea of where you are heading. That will also help you to avoid getting off track by spending more money then is necessary. 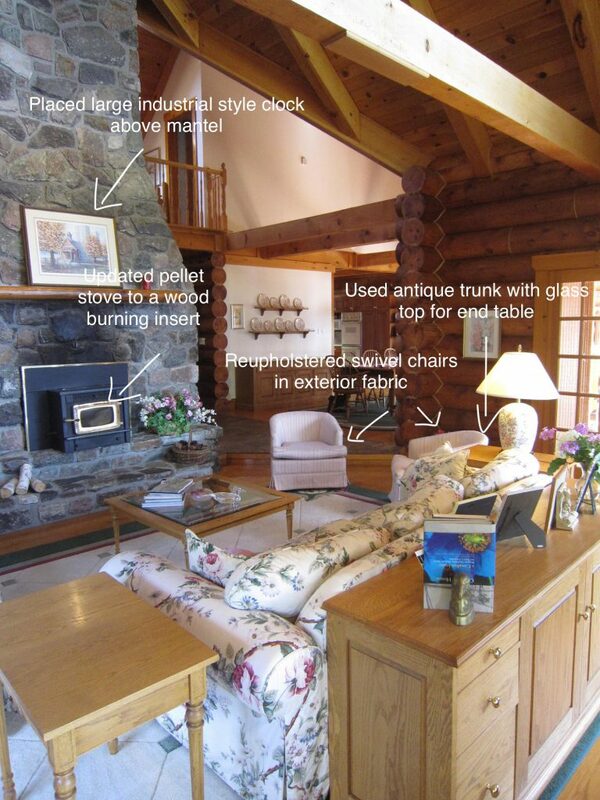 How can I help you design your living room? Published and made the cover! Such exciting news for my small business! If you are in Ottawa you can pick it up at Farm Boy, Bridgehead Coffee, Tagalong Toys, Tamarack Model Homes, Chapters, etc… and also apparently it is in the Globe and Mail as an insert. 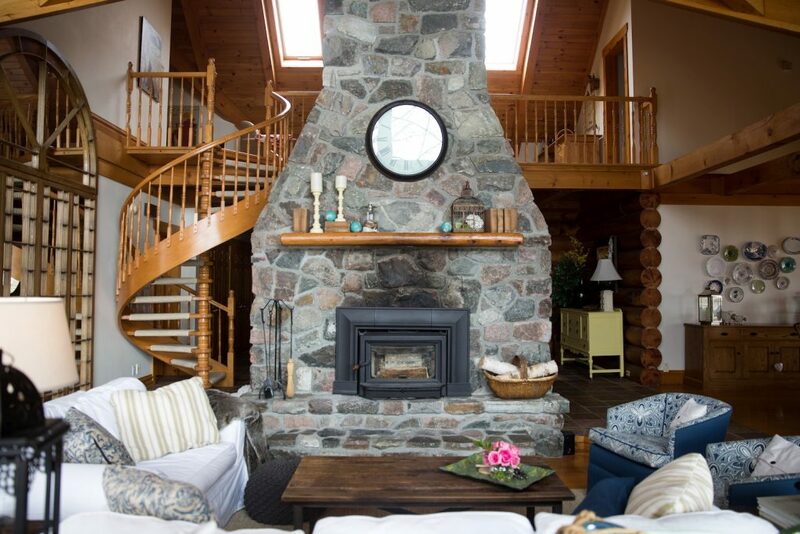 I’ve also written a few posts with more detailed information on our renovation of the cottage. 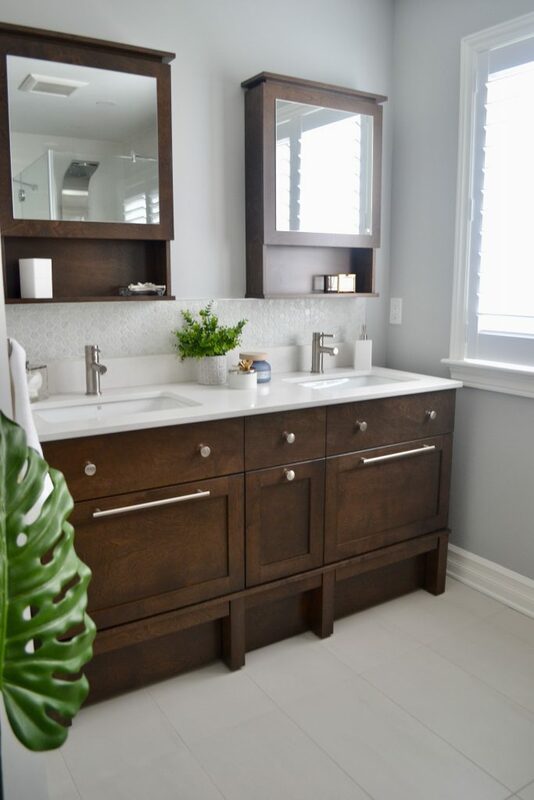 Click here to read about the living room transformation and here for the bathroom reno. Feeling a little overwhelmed? How about some design ideas to reduce anxiety? 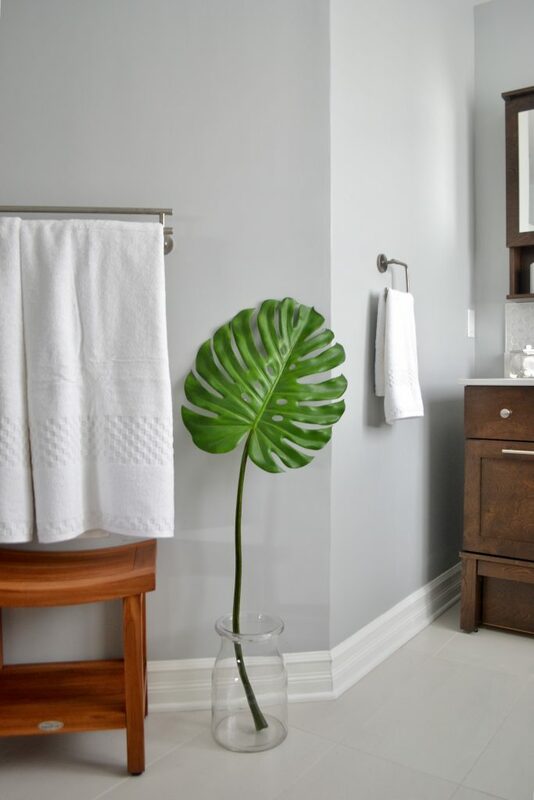 These six design ideas can help reduce your anxiety by targeting some of the smaller details in your home. If you have ever struggled with anxiety you know how hard it can be to manage and to overcome. It has a way of sneaking into every part of our life and we need to chisel it out out of there, little by little. While these tips won’t cure your anxiety they will help soothe you and your family. They may be just the thing you need to get some calmness back in your life. Target your sense of smell. 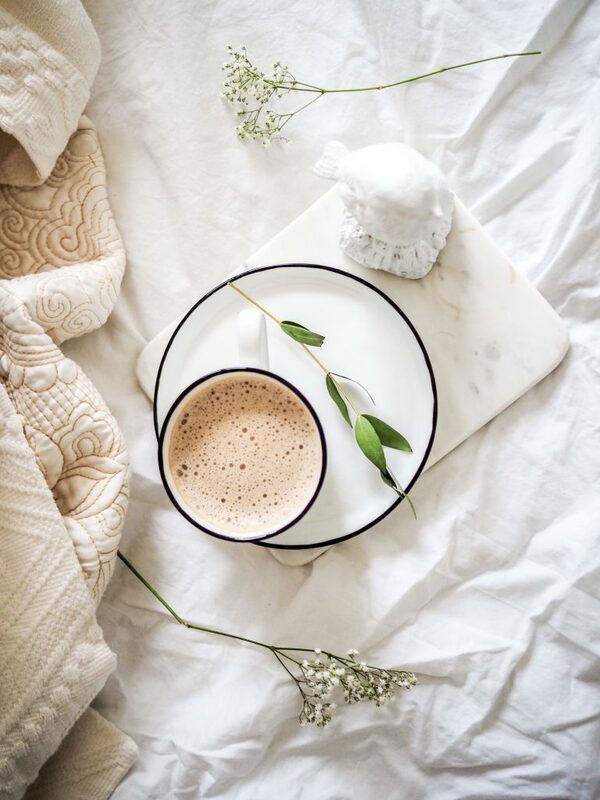 This is the perfect time to use an oil diffuser in your main spaces, or perhaps you’d prefer a scented candle. Certain oils such as lavender can help you relax and decompress and peppermint is great for relieving headaches. Fresh flowers or plants. A touch of the outdoors, especially colourful ones will instantly give you a sense of peace. So don’t you regret that impulsive bouquet purchase at the grocery store’s checkout line, it may be just the medicine you need. Keep your rooms open and airy. Feeling like there is space in your home, can make you feel more relaxed and calm. Removing a few pieces to give the remaining furniture a little more breathing room can achieve this and may give you more breathing space as well. Open those windows and drapes. Perhaps those heavy drapes have had their time. Light, airy drapes that will let the natural light in can go a long way to lighten your mood and bring the outdoors in. Remove clutter. I know this is a huge anxiety trigger for me, and my family knows this all too well. I actually feel a little claustrophobic when I’m in a cluttered space. So no more excuses, it’s time to remove the visual clutter and watch how much lighter and freer you feel. Use soothing paint colours. There is actually a science to colour therapy and it has been well proven over and over. Soft pinks, greens and blues are know to create feelings of wellbeing and calm, while colours like bright red, chartreuse and neon yellow can cause overstimulation and restlessness. It just may be time to get out the paint deck and contemplate a new colour scheme. With today’s highly stressed and fast paced lifestyles a little anxiety reduction is always a good thing. Implementing these small changes may help you create a more balanced and happy life and perhaps reduce anxiety as well! Are you struggling with finishing or even starting to design a room. It’s something we have all experienced, even us decorators and designers. Life is so distracting sometimes and it can be hard to move forward. However, the key is to keep making decisions and to focus on ONE ROOM AT A TIME!!! I know, I know, I always say that your home should be cohesive and it does, but trying to design a whole home can be hugely overwhelming. 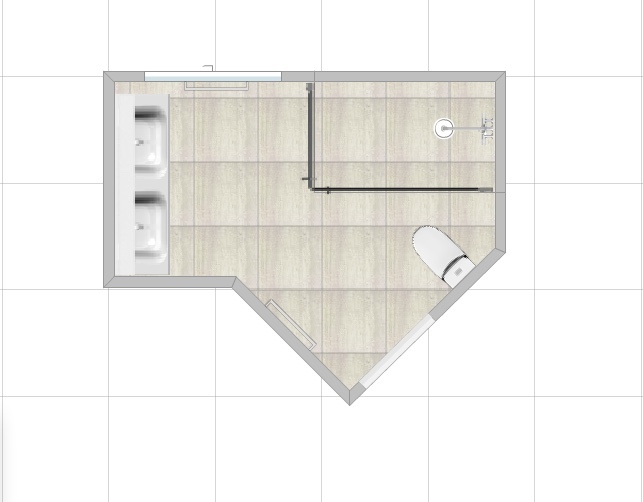 So tackle one room at a time and I think you’ll see that one room leads to another. 1. Make a plan. Decide on how you will be using the room, who will be using the room and what you need to do that properly. If it’s a family room and you will be using it to watch television and do crafts. You’ll need to have comfy seating for the tv and a large table with appropriate flooring and lighting for craft time. 2. Plan your lighting. Lighting is so important to a room. Just think how annoyed you are when you don’t have the proper lighting when you are trying to do something. Make sure there is ambient lighting (the general lighting for a room) and the appropriate task lighting (such as table lamps for reading or pot lights set over the craft table). Decorative lighting can be added for mood and ambience in the form of sconces, candles or a decorative floor or table lamp. 3. Style and colour. This goes along with #1 in that you need to have an idea of what style you would like. The best way to do this is with magazines – pull out pictures and keep a file or make a pinterest board. I’m eventually going to post some tips on keeping your pinterest boards on point. After you have a bunch in the file or pins on your pinterest board, a clearer picture of your style will emerge. Tada you have your inspiration. Colour will also show up in these photos. The colour of the walls will be determined at a later stage once you have the bigger pieces decided upon. 4. Large pieces. Now is the time to invest in the larger more expensive pieces for the room. Such as a sofa, area rug, draperies and case goods. These are the items that you will be keeping for the long term and they form the base of your design. This is where you usually spend the bulk of your budget and because of this I usually stick with classics and neutrals for these items. You can however diverge from this tract, if for example you love red and fall in love with a red sofa. GO FOR IT! This is what will make your room, you! 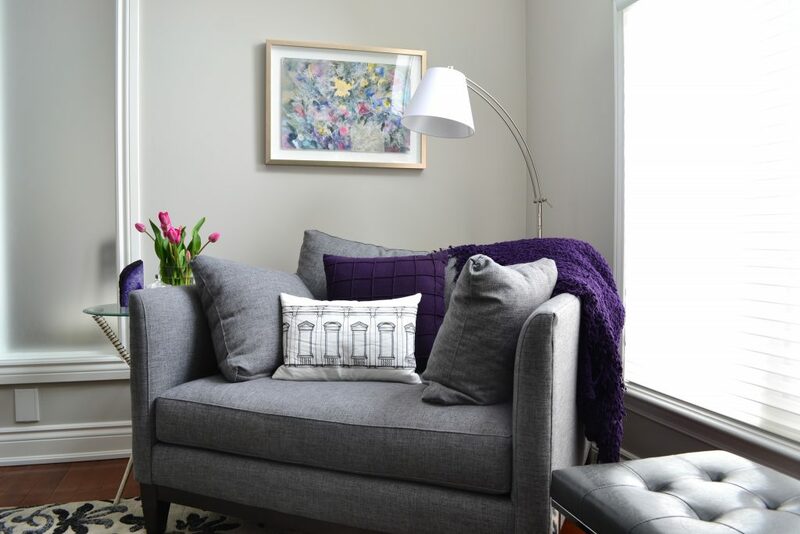 A note here about pattern, if the larger items that you have decided upon are all solids you may want to add some pattern either in the area rug or in a smaller upholstered chair or ottoman. This gives the room some pizzazz. Otherwise I would consider adding some wallpaper to the walls instead of a solid paint colour. The key with pattern is to ensure that the pattern sizes are not all the same. For example, if you have a large pattern on the area rug then have a smaller pattern on the ottoman, so vary the scale of your patterns. 5. Shopping. Okay now that you’ve decided on the larger items and their cost, you can form a budget. This will guide you as to where you can splurge and where you can save. A great room always has some of each in it – that is what makes it interesting. Remember to keep some money for paint and accessories (usually about 15-20% of the budget). 6. Paint colour. I look at all the major items purchased and the rest of the home and then decide what would be the best colour choice. Paint is one of the most inexpensive parts of the design process and with so many colours, this works the best. Once I know the main colour of the walls, I can then go on to the next step, accessory shopping. 7. Accessories. I do up a list of what I think I’ll need. For example, small round end table, gold framed rectangular mirror approximately 24”x12”. This is also when I check to see if there is an abundance of one shape in the room. If there are lots of square items, I balant with some round smaller items and accessories. Most decorators and designers will pick up way more accessories while shopping. Gives us a great bunch of choices when doing the final placement. Just return the items that you don’t need. So be sure the store you are shopping at has a great return policy. 8. Keep on track. Now is when you’ll usually get distracted and start looking for items for another room in your home. Try and keep focused and only purchase for the one room. Your budget will thank you and you’ll have one room done instead of all of them in progress. 9. Put everything in place. If you have managed to hold off now is the time to put everything in place. Of course, first off the room should be painted and then the larger items positioned in place. Then the smaller furniture pieces and accessories, such as artwork, mirrors and decorative pieces are added. And Voila!! a perfectly finished design!! 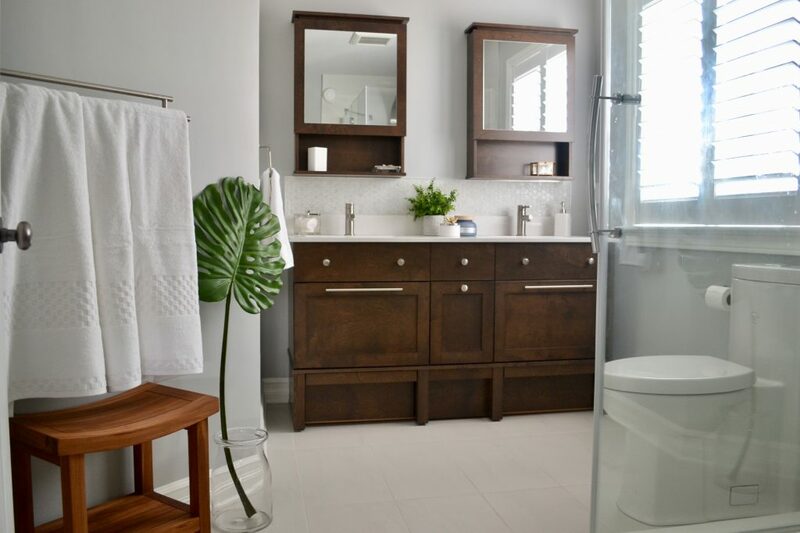 Do you need a bathroom renovation that will make your house more serene, more practically organized and more like you? Well, keep reading to find out how the process works and just what can be achieved in your home. 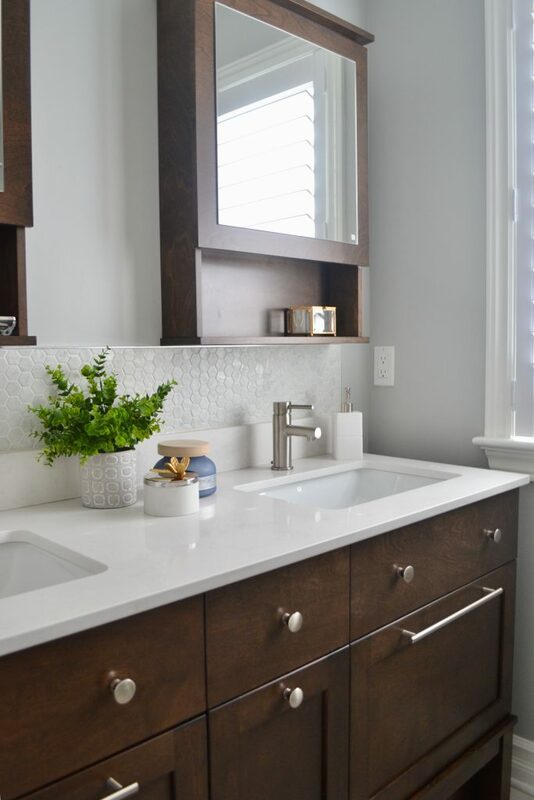 This bathroom transformation went from dark, cluttered and drab to white, clean and serene. Isn’t she pretty and practical now? 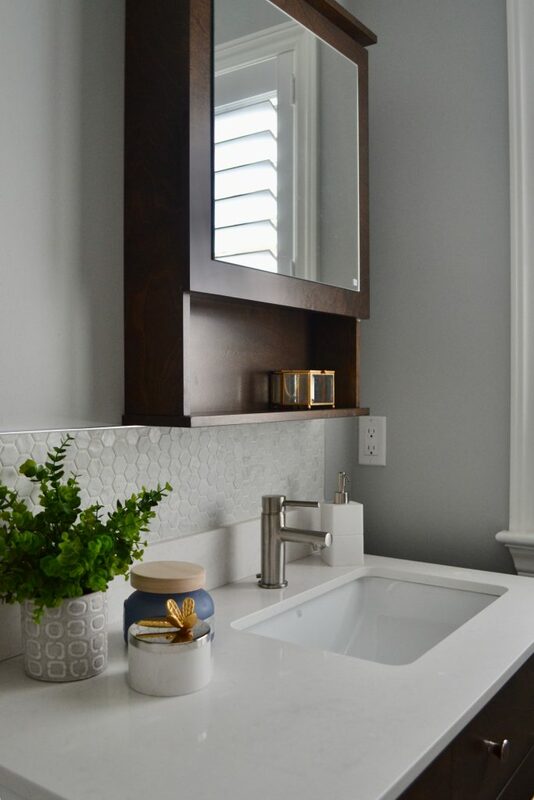 This master bath had no personality and obviously was dismal at even providing proper storage. 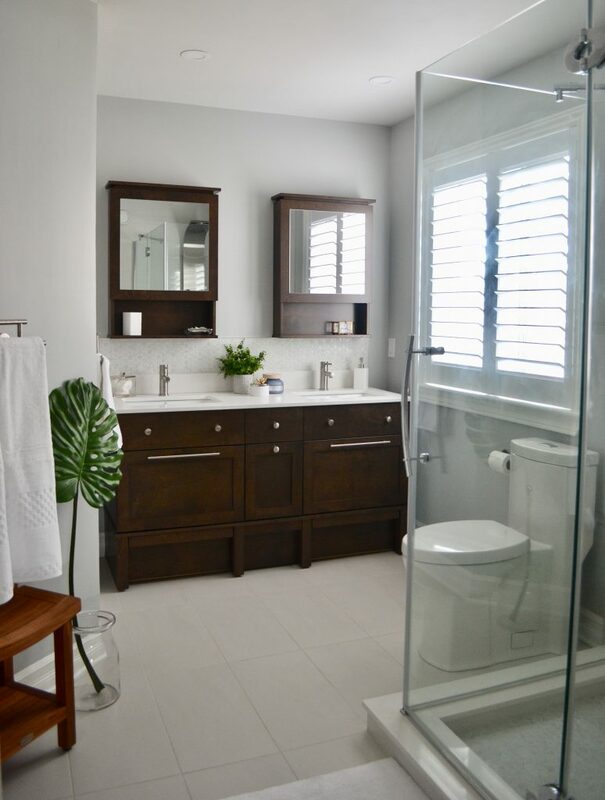 It had only one sink in a crowded vanity, a window and tub where my client had envisioned the shower going, an awkward semi-circular shower enclosure and virtually no ventilation or proper lighting. It is definitely not possible to get ready to take on the day here or for that matter relax at the end of the day? You can see the semi-circular shower in the mirror opposite the vanity and behind the door. And the built in tub that was never used. I did up three different plans and after consulting with me and their contractor, the clients decided on this plan. Originally we were going to move the toilet and the door but moving a toilet is an expensive option, so in the end we left both the toilet and the door where it was. 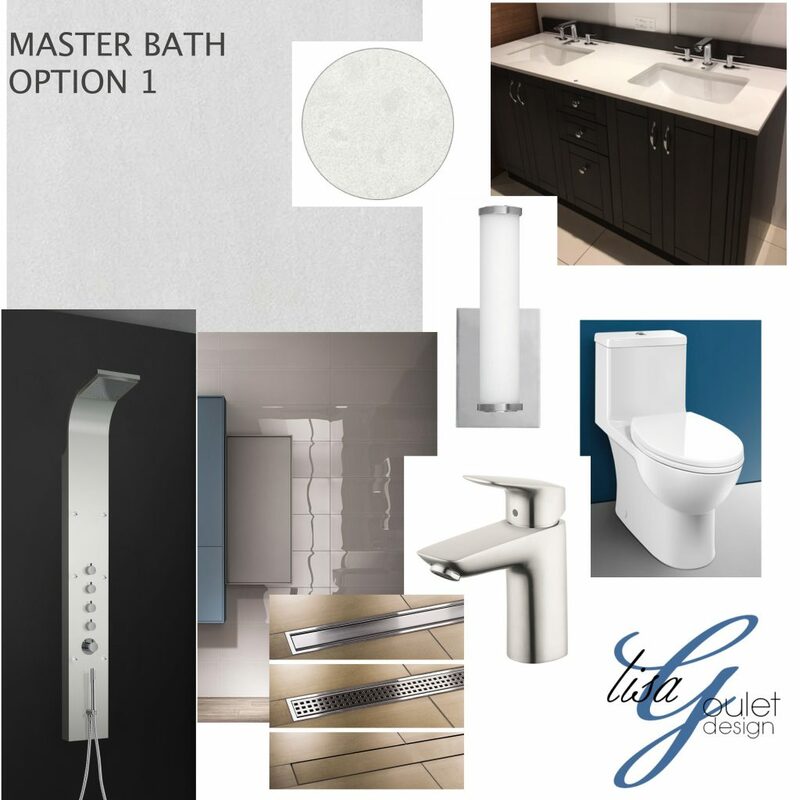 Then I did up two mood boards which shows tile, lighting and fixture selections. They went with Option 1. 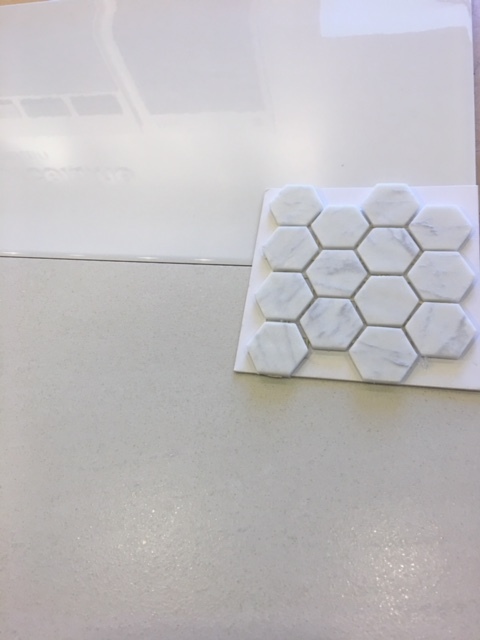 Here’s a closer look at the tile selections. 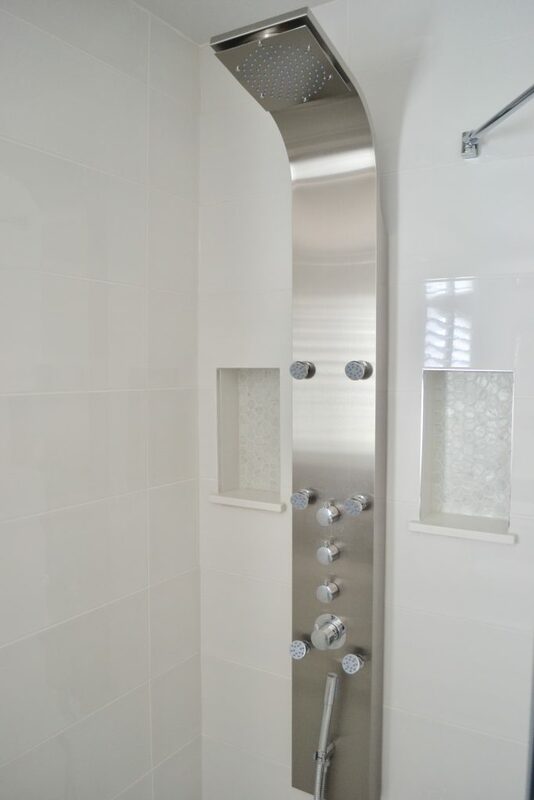 The large scale shower wall tile looks like glass but it is actually porcelain and it is a breeze to clean. As per the norm, some items were changed from the moldboard to creation. The vanity was a great find and you’ll see why as you keep reading. The lighting was also changed to discreet pot lights where needed. We felt there was enough going on in the vanity area so this kept the area cleaner. Where there was cramped, dark and non functioning, there is now this clean, serene, spa like space. So, what did we do exactly? 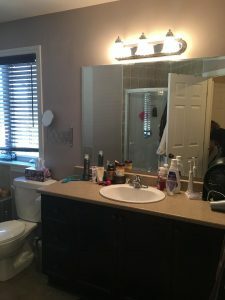 We moved the vanity from it’s existing place at the right of the door to where the built in tub was. That way we got enough room to put two sinks and that enabled us to place the shower where the vanity had been. 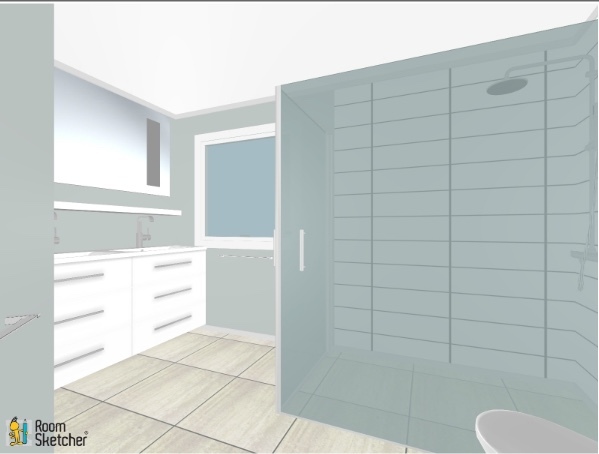 Originally, the clients wanted to swap the tub for the shower, but then the window was going to be partially in the shower enclosure. It could have been done, but this was a more cost effective and worry free solution. Moving the shower where the vanity was allowed for a much larger area and since it is all glass it feels very open when you are entering into the bathroom. My clients also wanted a large inset shower shelf but since the main, long wall was an exterior wall, we couldn’t put a shelf there. 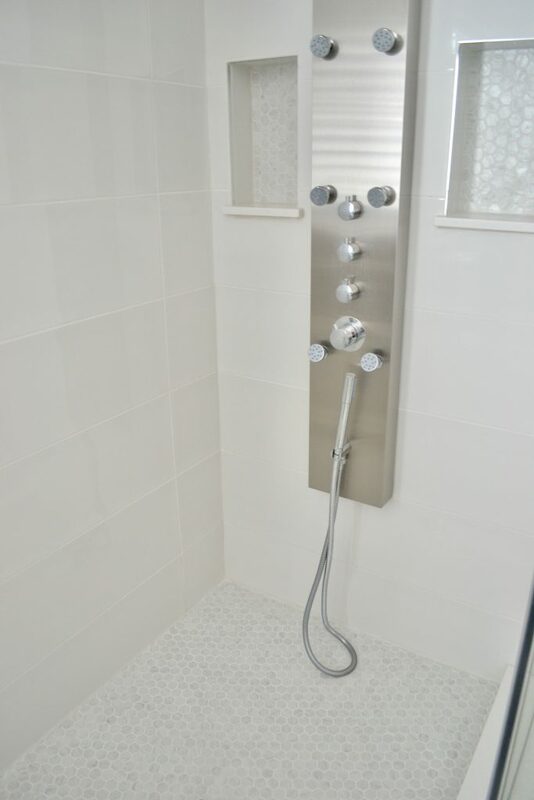 So, instead we placed two smaller inset shower shelves, one on each side of the shower tower and it worked perfectly. 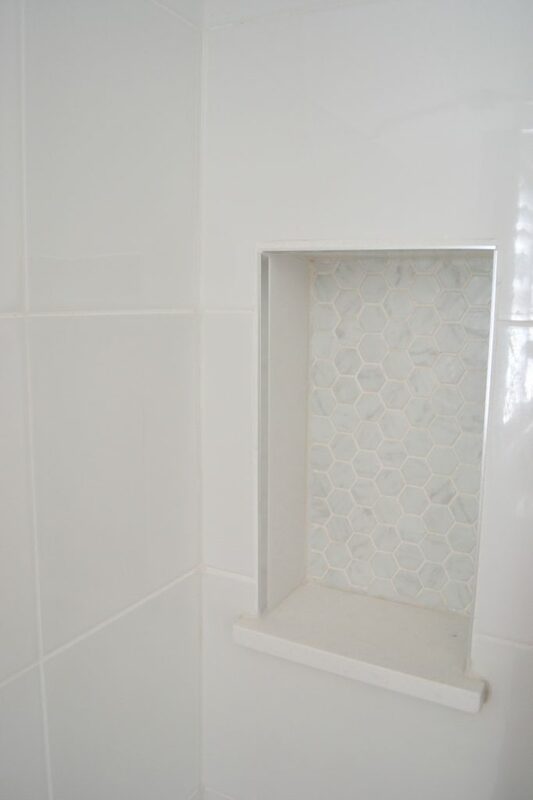 The inset shelf tile is the same as the shower floor and it was also used as a vanity backsplash, for continuity. 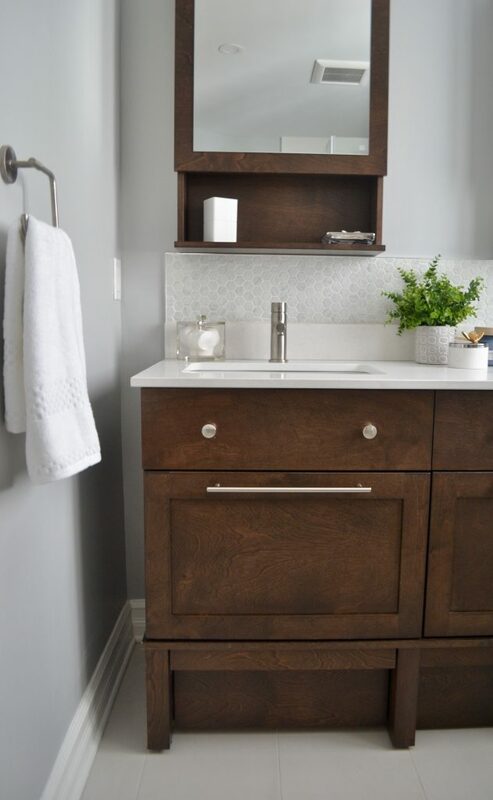 The cool thing about this vanity is that the bottom toe kick is actually a secret drawer. Therefore, it has even more storage than you expect. And those upper mirrored cabinets, well they cantilever up for easy access to even more storage. My client, picked up this adorable teak stool that she uses in the shower, when needed. How much nicer is it to get ready in this dream of a bath? 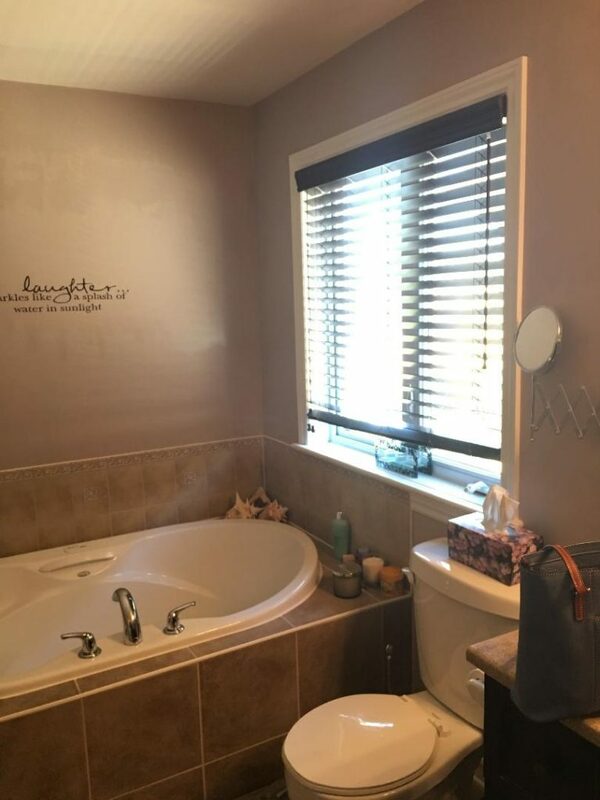 If you need the answer to that question, give me a call and we can start working on your dream bath.